The NexiusZoom includes world class optics equivalent to the Olympus SZ-61 and Leica S6E. Super widefield HWF 10x/22mm eyepieces (sold separately), make for a very comfortable viewing experience and combined with the impressive 3W NeoLED™illumination, the NexiusZoom is a superb microscope for the most demanding Materials Science applications. The standard field of view is 33mm-4.9mm with a working distance of 110mm. Maximum working distance is 187mm with a 0.5x barlow lens. Includes HWF super widefield 10x/22mm eyepieces and rubber eyecups. Optional 15x and 20x eyepieces are also available as are 0.5x, 0.75x, 1.0x (protective lens), 1.5x and 2.0x auxiliary barlow lenses. The NexiusZoom includes world class optics equivalent to the Olympus SZ-61 and Leica S6E. Super widefield HWF 10x/22mm eyepieces (not included) make for a very comfortable viewing experience and combined with the impressive 3W NeoLED™illumination, the NexiusZoom is a superb microscope for the most demanding Materials Science applications. The standard field of view is 33mm-4.9mm with a working distance of 110mm. Maximum working distance is 187mm with a 0.5x barlow lens. The trinocular port is a 23mm smooth eyepiece port or can be fitted with an optional C-Mount adapter. 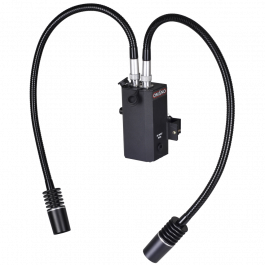 The new OptixCam Summit D3K2 Series 3.1MP digital microscope camera introduces SuperSpeed USB 3.0 technology to the world of digital microscopy. Faster data transfer and more efficient power consumption make for an efficient and versatile imaging solution for educators, life science researchers, healthcare professionals, and many other professional disciplines. Windows PC users benefit from easy-to-use feature-rich software, accurate color, clarity and image detail, while USB 3.0 data transfer maximizes productivity and user engagement. USB 3.0, also known as SuperSpeed™ USB, is the latest generation of USB technology and delivers several key performance benefits. For example, USB 3.0 transfers data up to ten times faster than USB 2.0, resulting in quicker transfer of large image or video files and greater workflow efficiency. 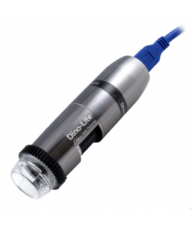 This is ideal for data-streaming applications found in the research lab or biology classroom. It also does away with the power drain common to USB2.0, resulting in less power used and longer battery life in laptops, tablets and peripherals. The Summit K2 series camera bring affordable digital microscopy to a wide range of documentation demands of routine life science, industrial and educational environments. 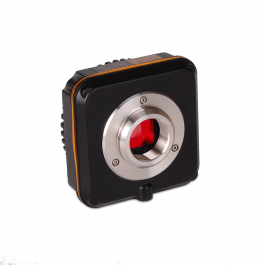 Built around the proven Aptina MT9T001 CMOS color sensor, they share a broad dynamic range, progressive scan and 12-bit parallel resolution for accurate color reproduction and optimal image quality. All SK2 series cameras are CE and FCC certified. The included Windows-based K2View software creates a complete imaging solution with intuitive camera controls, image capture and advanced options like annotation, geometric measuring and storage in JPG, BMP, TIFF, PNG, PCX AND TARGA format. 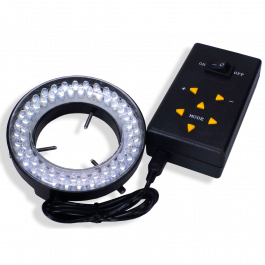 The software also includes auto white balance, color enhancement, anti-flicker and other benefits. 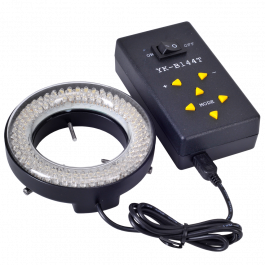 TWAIN and DirectX plug-ins are also included on the installation CD and are independent of the main driver, allowing discreet control of the camera for these applications. PLEASE NOTE: This software is not MAC compatible. 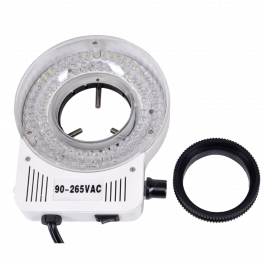 Accessories include K2View Software CD, C-mount adapter, 23.2mm smooth bore fixed reducing lens (0.5X), USB 3.0 cable. Camera dimensions: 80mm x 80mm x 38mm. Package Wt. 1.2 lb. 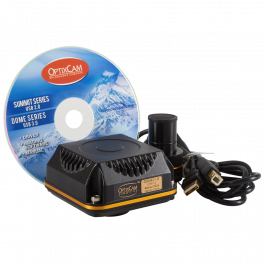 The new OptixCam Summit D3K2 Series 5.0MP digital microscope camera introduces SuperSpeed USB 3.0 technology to the world of digital microscopy. Faster data transfer and more efficient power consumption make for an efficient and versatile imaging solution for educators, life science researchers, healthcare professionals, and many other professional disciplines. Windows PC users benefit from easy-to-use feature-rich software, accurate color, clarity and image detail, while USB 3.0 data transfer maximizes productivity and user engagement. NexiusZoom 1.0X Auxiliary Barlow Lens. 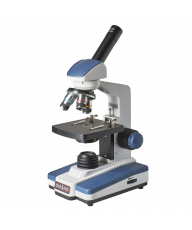 Euromex's NexiusZoom zoom stereo microscope head brings a new level of quality at a remarkably low price level. With optical quality comparable to the Olympus SZ-61 and the Nikon SMZ-645, the NexiusZoom is up to 60% cheaper and is highly recommended by Microscope.com. 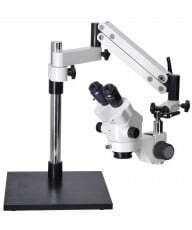 In this configuration, it is paired with our top of the range V15 dual arm boom stand that features 'Continuous Glide' ball bearing operation for a stereo microscope of unbeatable value. With HWF10x/22mm eyepieces, and superb optics, the NexiusZoom offers a thoroughly enjoyable viewing experience that minimizes eye strain. 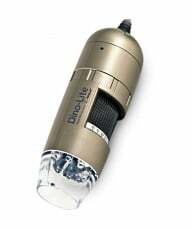 0.67-45x zoom combines for standard magnification of 6.7x-45x, but remarkably, given the quality of the optics and additional lenses, the microscope can operate effectively from 3.35x-180x with full resolution. The standard field of view is 33mm-4.9mm with a working distance of 110mm. Maximum working distance is 187mm with a 0.5x barlow lens. 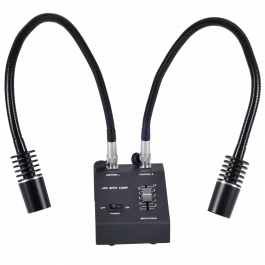 NOTE: The NexiusZoom-Trincular microscope head features an internal beam-splitting prism system which directs light to both eyepieces and the trinocular camera port simultaneously, allowing for efficient and continuous observation and documentation. The Omano V3 pole stand's ergonomic design includes beveled leading edges for operator comfort. It features a tall, 12" vertical pole for extended working distances and a 12" x 12" base with rubber feet to protect your working surface. A safety collar and black/white contrast plate is also included. 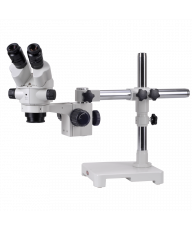 Includes: NexiusZoom Microscope head, HWF10x/22 eyepieces and rubber eyecups, V3 stand, focus ring, hanging bar and dust cover. Euromex - NexiusZoom Stereo Zoom Microscope from Euromex Optics on Vimeo.